Nvidia has announced its latest financial results, and the GPU giant made the unusual move of clarifying exactly how much money it had raked in from selling graphics cards to cryptocurrency miners – alongside the revelation that these sales will drop massively in the next (currently ongoing) quarter. And that would obviously be good news for gamers, particularly when you consider that yesterday, we saw GeForce graphics cards come back into stock at retailers in a big way (following recent shortages). As Bloomberg reports, Nvidia admitted that demand from the cryptocurrency market had been stronger than the firm expected in fiscal Q1, with sales totaling $289 million (£215 million, AU$385 million). Projected earnings were around $200 million (£150 million, AU$265 million), incidentally. However, in an earnings call, the company said that crypto sales would likely drop by about two-thirds in the current fiscal quarter. Yes: two-thirds. Combined with the aforementioned stock levels of GPUs bouncing back, this should herald an end to any graphics cards shortages, and gamers having to pay far more for a GeForce product than the recommended asking price. How much did Nvidia make in total in the quarter? Well, it was another record-setting affair with revenue of $3.2 billion (£2.4 billion, AU$4.3 billion) recorded, which is up by two-thirds year-on-year. It wasn’t just GeForce cards that saw a strong performance, either, with Nvidia’s data center profits hitting $701 million (£520 million, AU$930 million), up 71% compared to the same quarter last year. 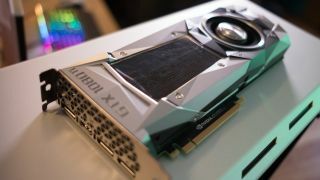 If demand for GPUs from crypto miners is going to continue to slump in a major way, it’ll be interesting to see if Nvidia still goes full steam ahead with its plans for graphics cards designed specifically for that market. That said, there’s no telling what will happen with the cryptocurrency craze down the line, and what could be waning interest now might just turn around later in the year.